Former Northern Ireland international Keith Gillespie has paid tribute to ex-footballer Ugo Ehiogu following his death at the age of 44. The former Aston Villa and England defender passed away after suffering a heart attack. Ehiogu, an under-23s coach at Tottenham Hotspur, collapsed on the club's academy training pitches on Thursday. He was rushed to hospital but died in the early hours of yesterday morning. Former clubs and team-mates paid tributes to a "gentle giant". Gillespie (right), who played with Ehiogu at Sheffield United, said he was stunned. He posted online: "Devastated to hear about my ex-team-mate Ugo Ehiogu. Great player and all round great guy. Gone too soon. Thoughts and prayers with family." Ehiogu joined Tottenham as a coach in 2014. The club's head of coaching and player development, John McDermott, said: "Words cannot express the sadness that we all feel at the club. Ugo's immense presence will be irreplaceable. Our heartfelt sympathies go out to his wife Gemma and his family." Former Aston Villa team-mate and Republic of Ireland international Andy Townsend said: "He was a defender every team would like to have at the back." Former Bolton player Fabrice Muamba, who survived after suffering a heart attack during a 2012 FA Cup quarter-final, expressed his shock. He added: "Cherish life, it's promised to no one." 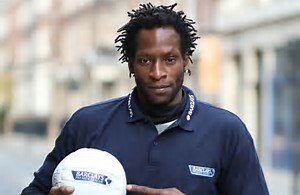 Ehiogu began his career as a trainee at West Brom before signing for Villa in 1991. He later joined Middlesbrough and also had a spell at Rangers. In 2001 he scored his only goal for England against Spain. The FA said it was "devastated to hear the news". Ehiogu married wife Gemma in 2005. He had two children - son Obi Jackson and daughter Jodie. Villa will hold a minute's applause before their derby against Birmingham City tomorrow, with both sets of players to wear black armbands.